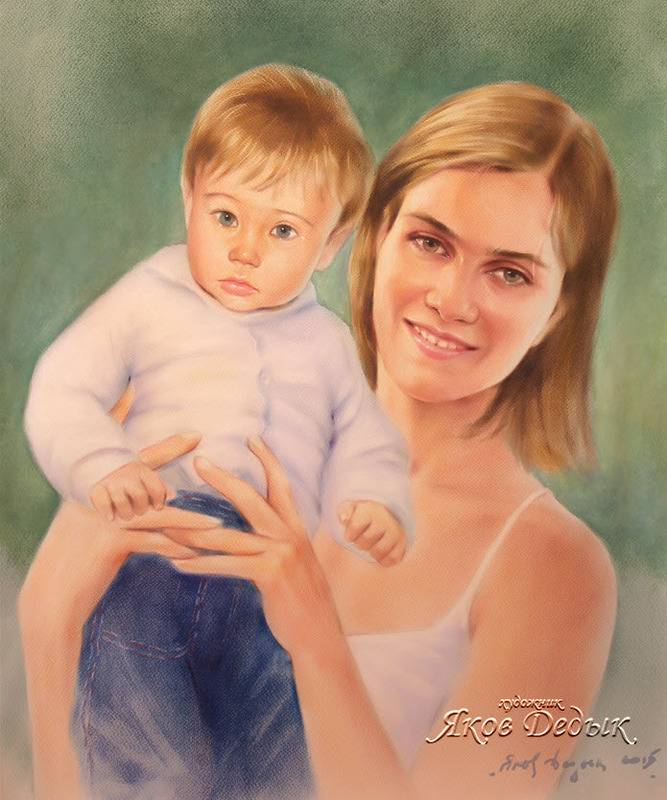 This page is where the group, family, paired portraits in various techniques. 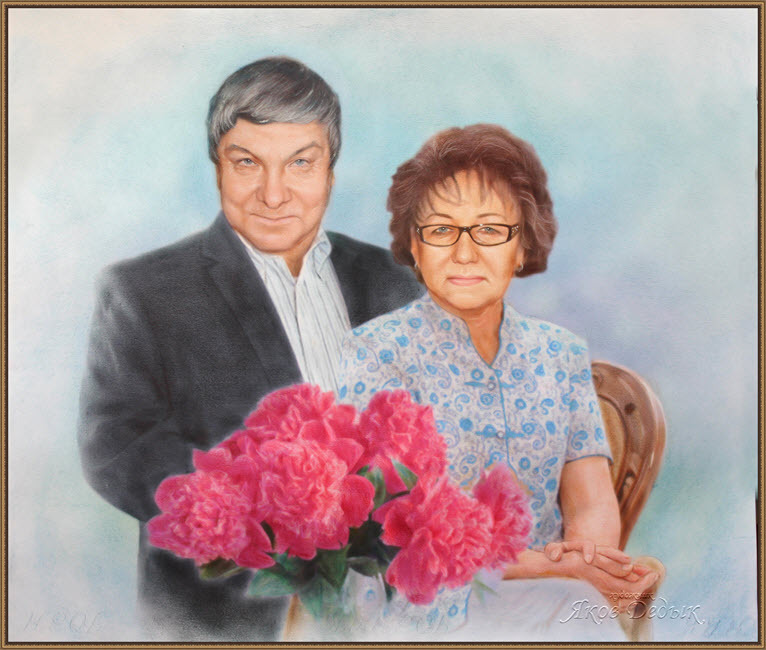 Mostly they bought as a gift for your relatives, friends, colleagues. 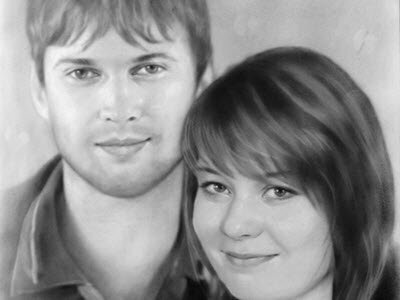 Reading portraits on this page if you like my style of , you can order a Portrait oil painting on canvas, dry brush, pencil, pastels, mixed media from life or photos, please contact me by phone in Moscow +7-962-189-15-98, Skype: yakov-dedyk, E-mail: yakovdedyk@yandex.ru. 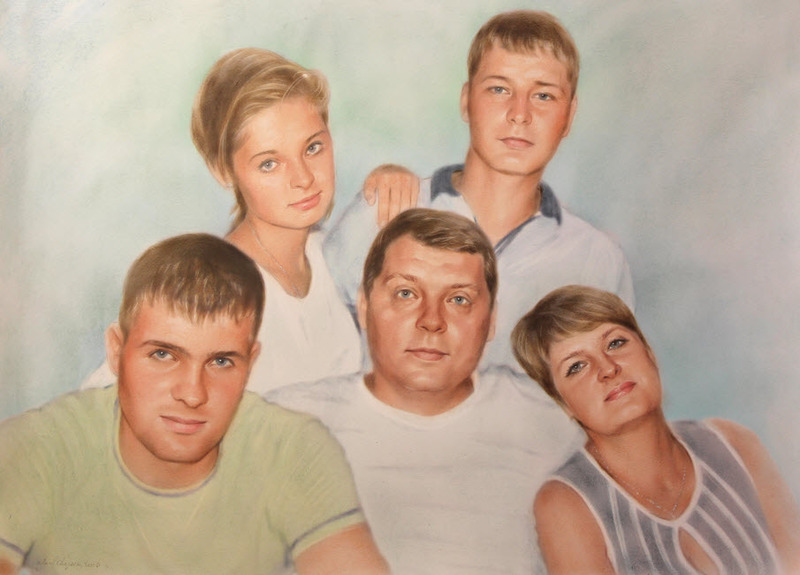 Group Portrait of the artist's portrait presents a special challenge. 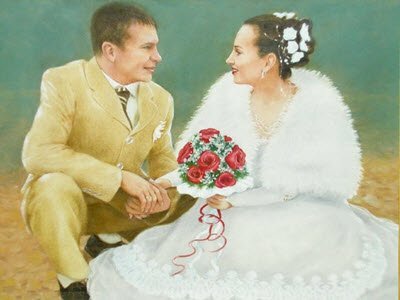 It should be the picture subject composition with c linkage of two or more shapes. 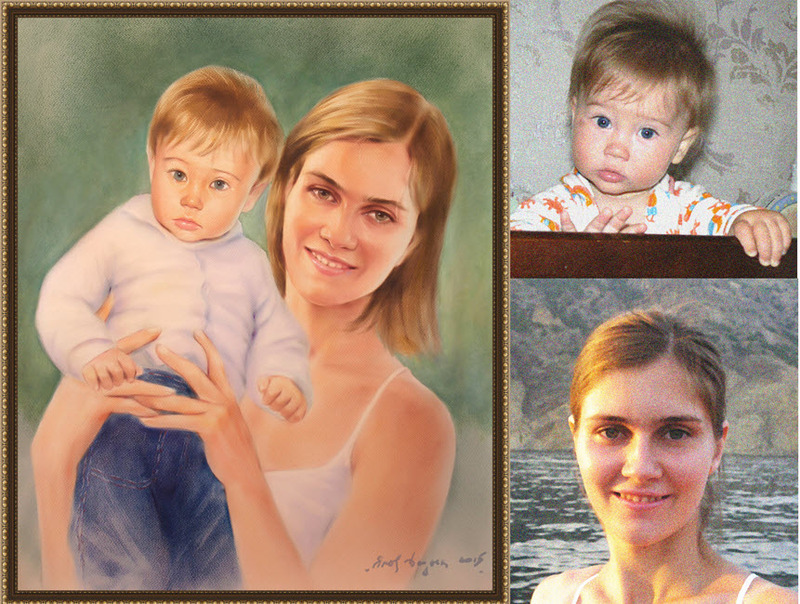 Sometimes you have to invent a plot almost completely for these portraits, and often with photographs and sketches that have to find by yourself. Often I have to draw even with two different images, different lighting quality, sometimes with a black and white and the other in color. 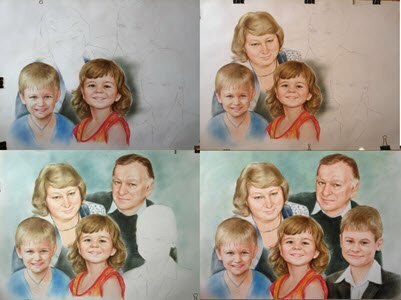 The customer only wants to see an end result and it is sometimes even difficult to find for consultation. 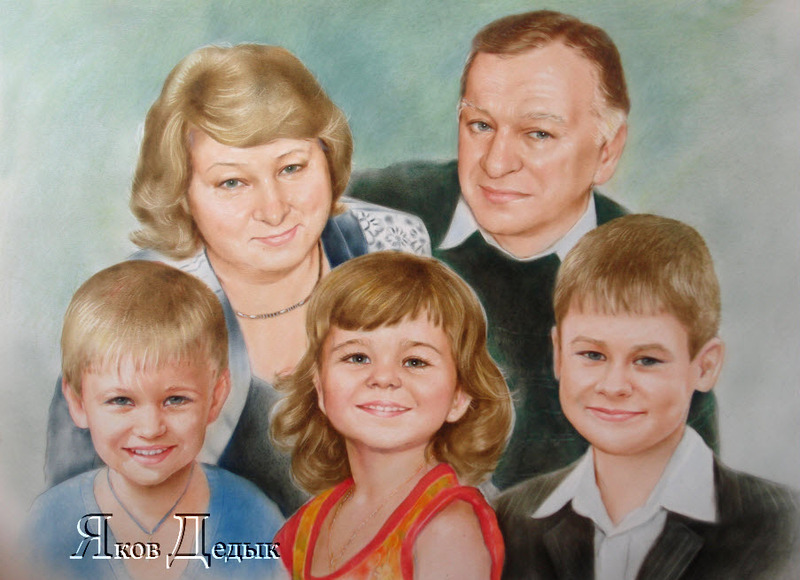 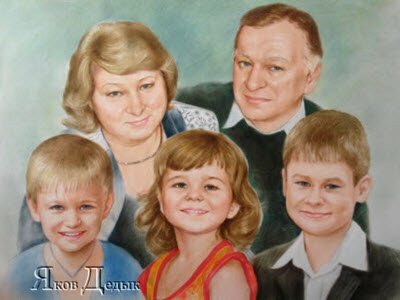 Such pictures (pair portrait, family portrait) ordered the relatives for their loved ones, and the naturally large group customers. 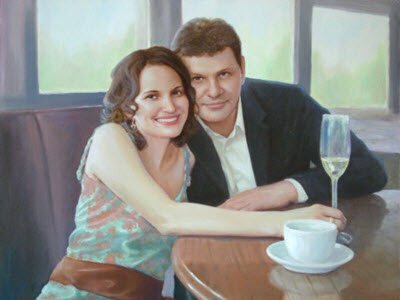 So gangbang or pair portrait taken only fairly experienced artists portraitists. 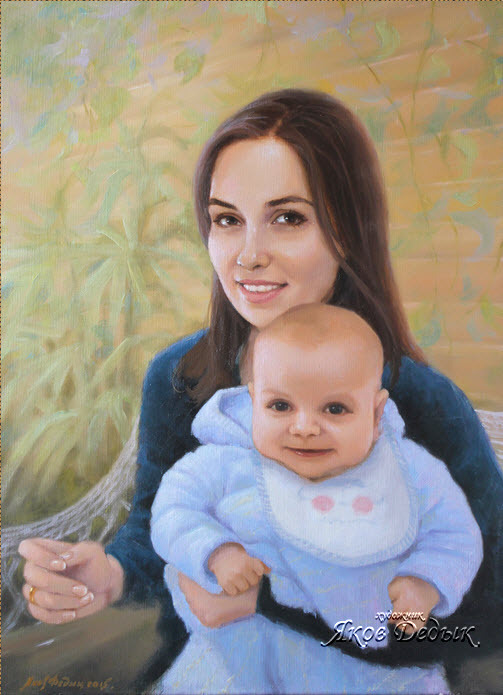 Portrait oil painting on canvas on the classical technology nowadays became uncommon. 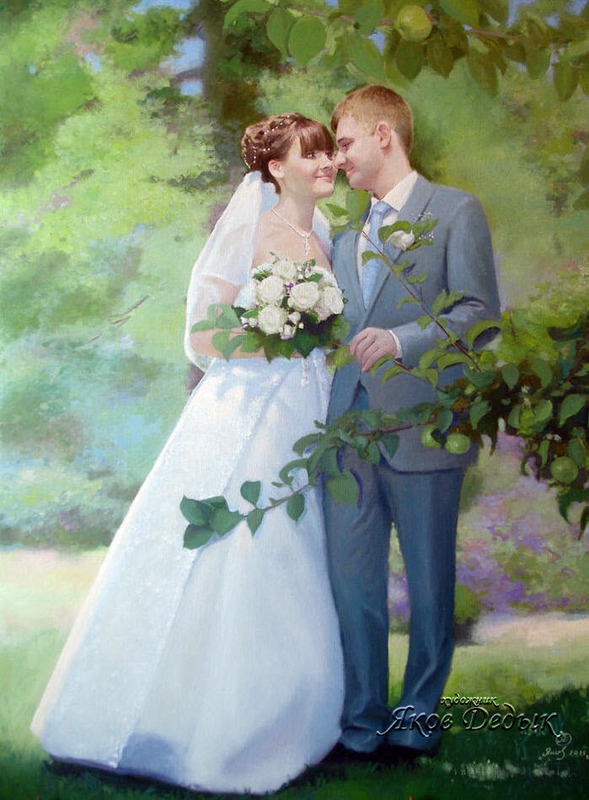 many 'artists' and the whole factory painting offer services for printing pictures and stylized under painting pictures, pointing out the advantages of these goods (execution speed, absolute similarity, affordable price, and so on), but all this advantages the pipeline. 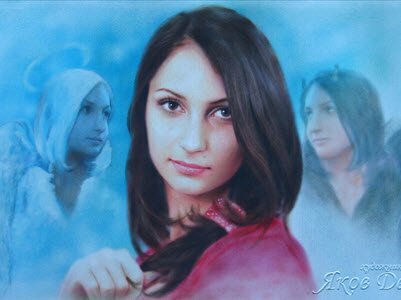 don't think these things can be compared: this is possible and looks like a painting but most likely photo manipulation or retouch. 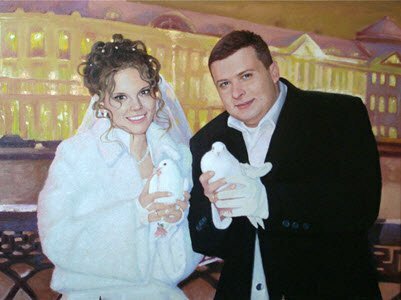 So, call a spade a spade. 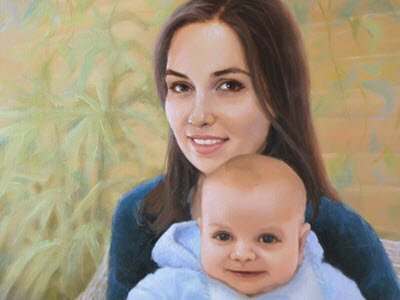 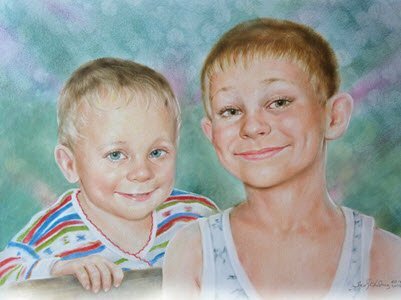 Portrait oil painting has its own history and technology that relies on more figurative nature scenic transfer means, and not an exact copy. 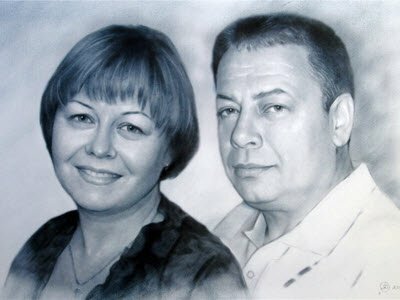 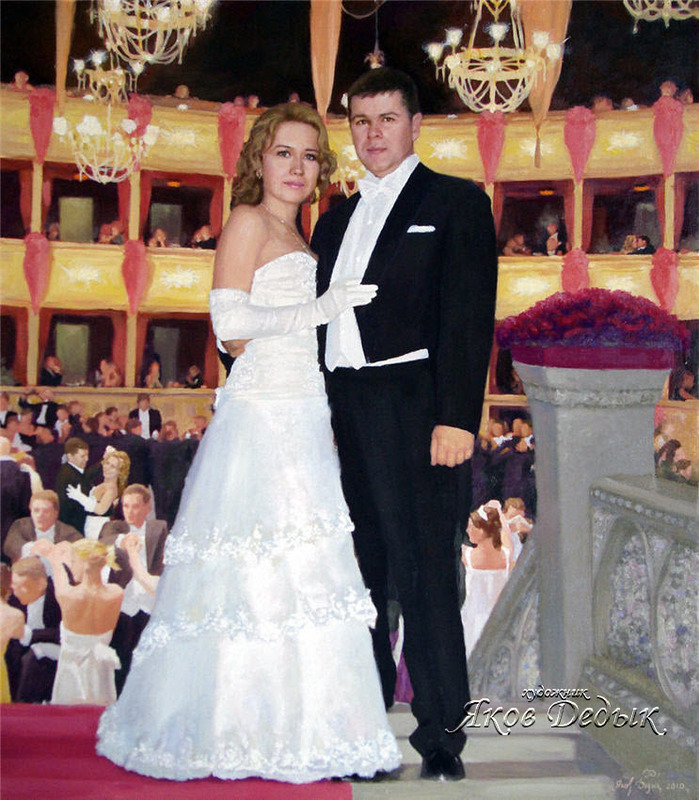 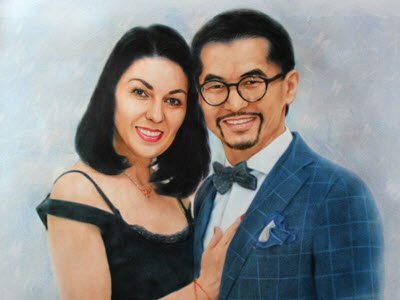 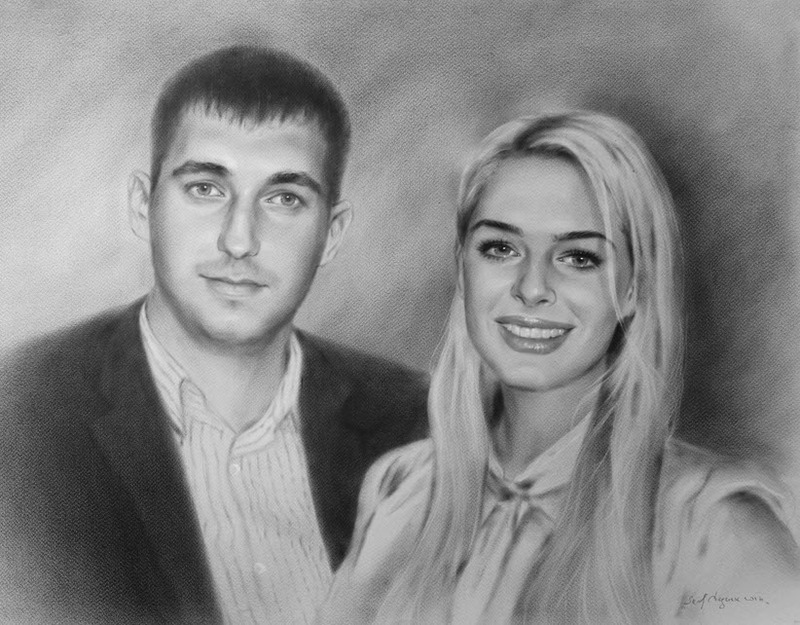 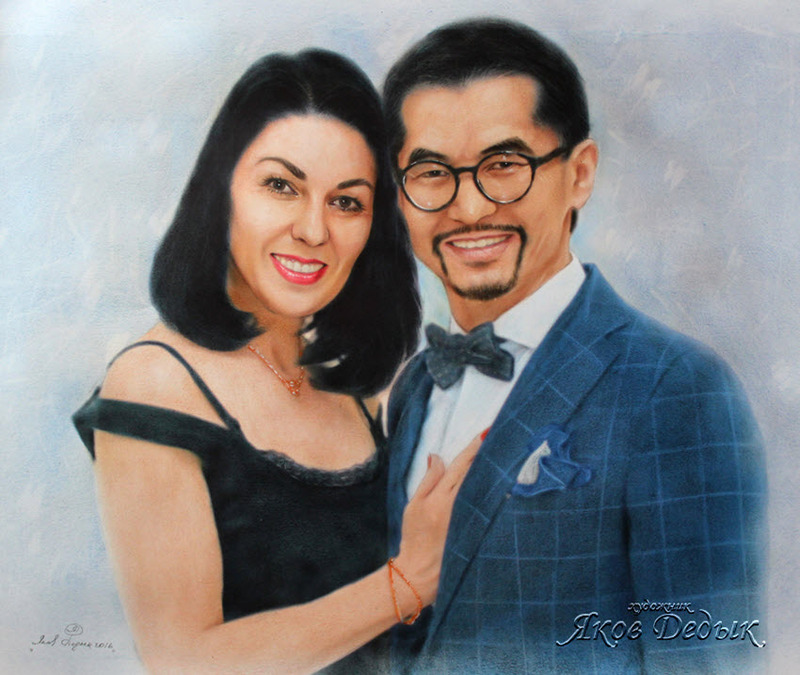 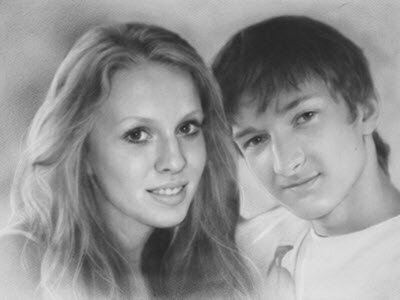 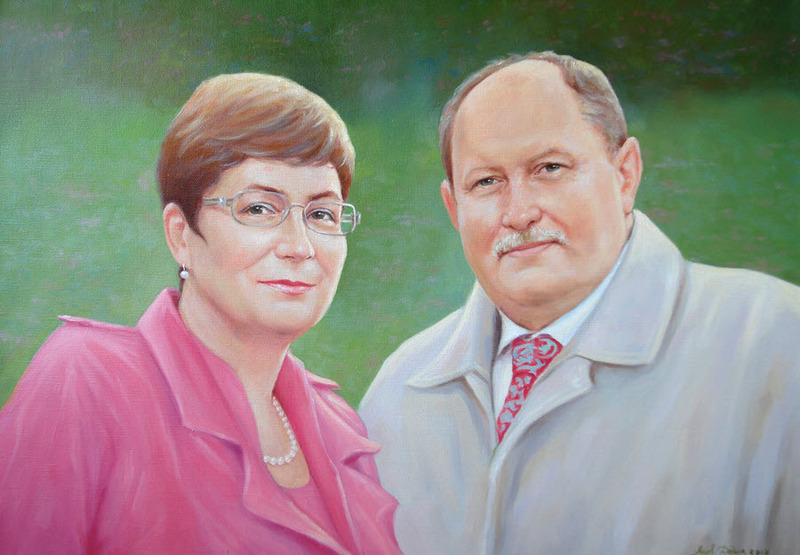 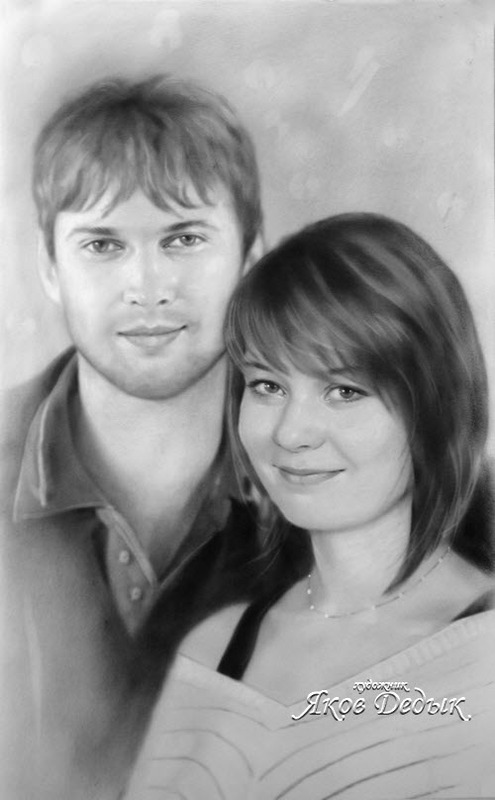 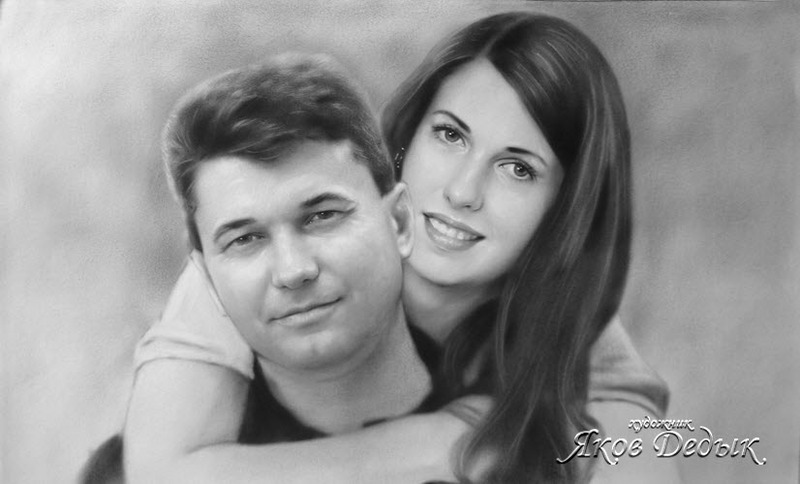 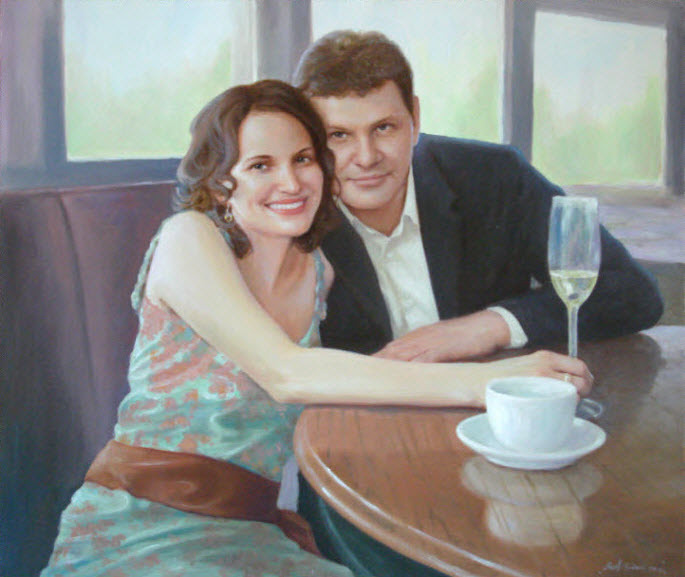 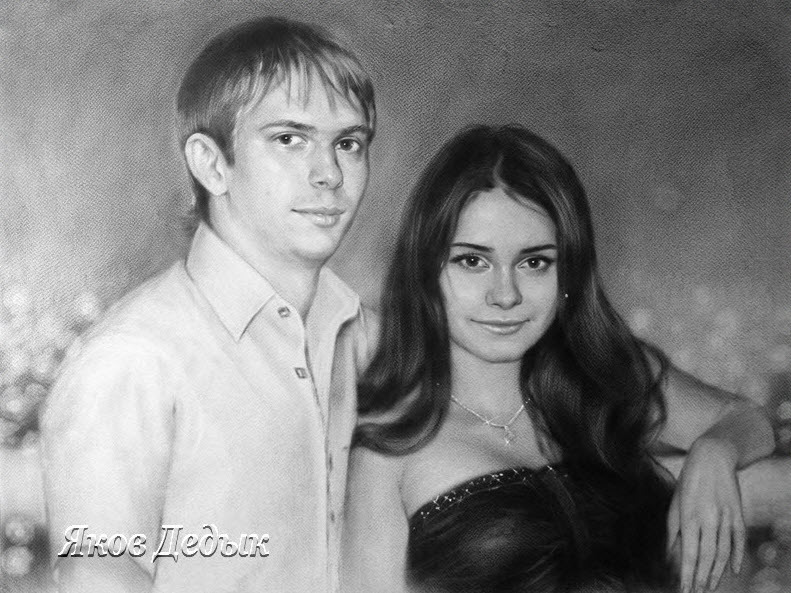 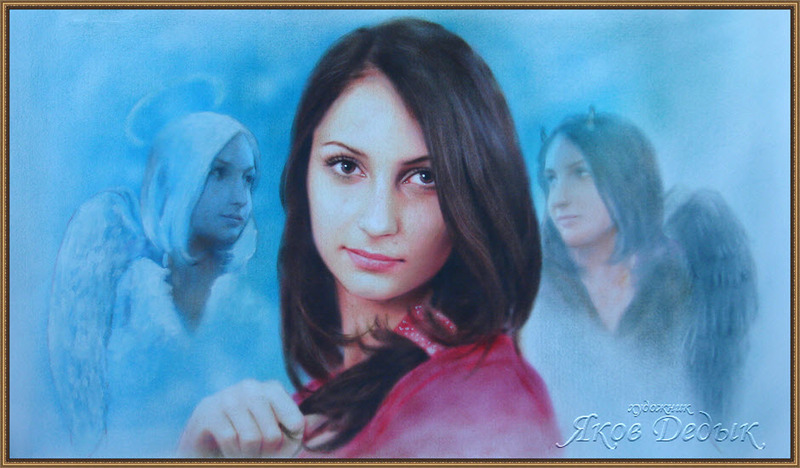 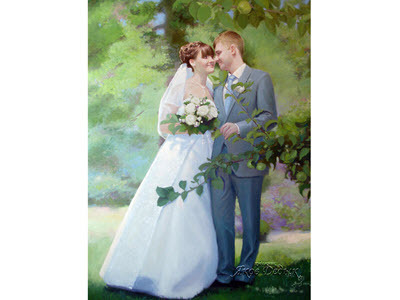 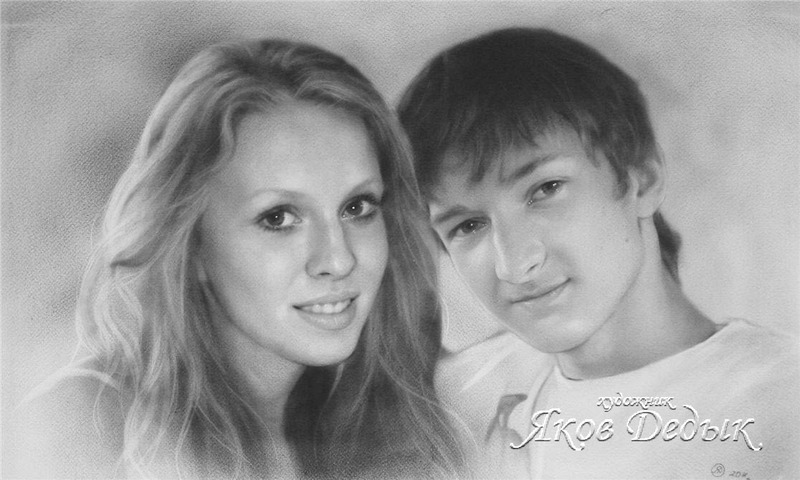 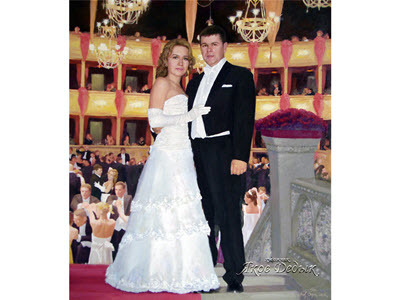 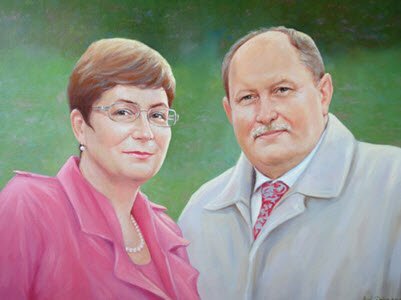 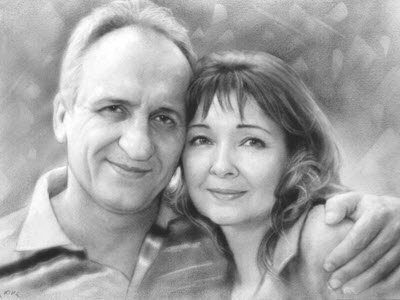 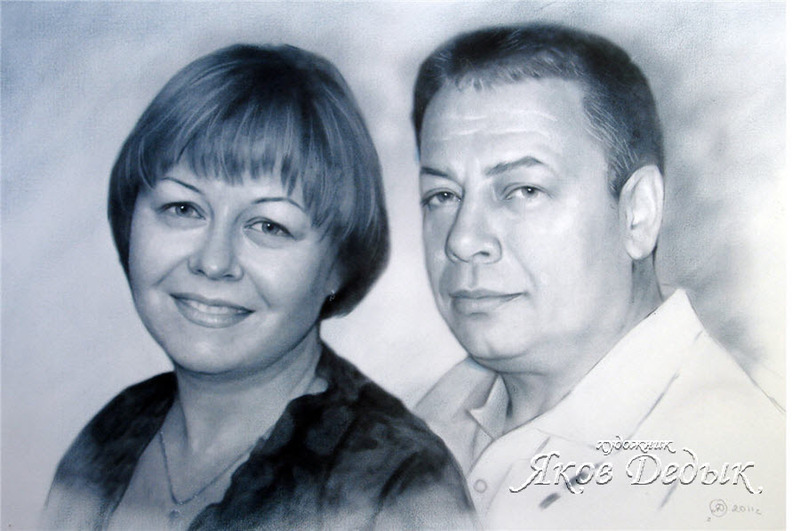 If you decide to capture a portrait in paints on canvas or on paper one of the people close to you, then I think modesty is not relevant here, it is worth to take this event seriously and to entrust this job to a professional artist with a specialization in which Yakov Dedyk - portraits to order from life and Photo. 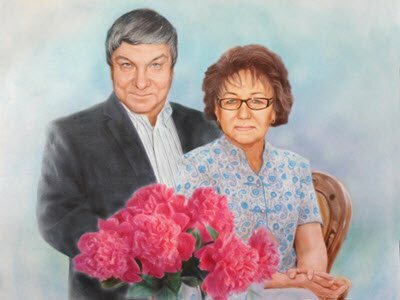 I perform orders mainly oil colors: Classic portrait oil painting on canvas, dry brush technique on paper or canvas. 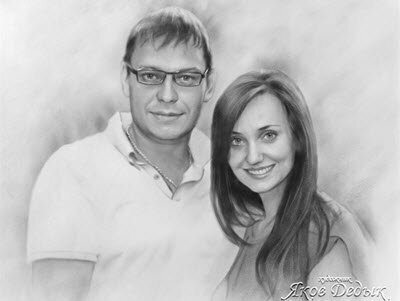 Monochrome (black and white) is a portrait with paint or two (main and whitewash). 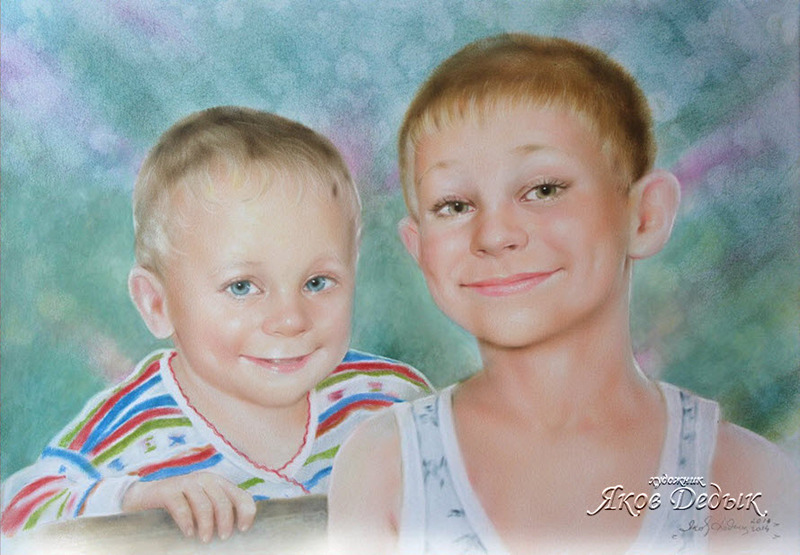 Color portrait in the technique of dry brush too limited palette of colors is used because, mixing among themselves, many as a result give dirty paint shades. 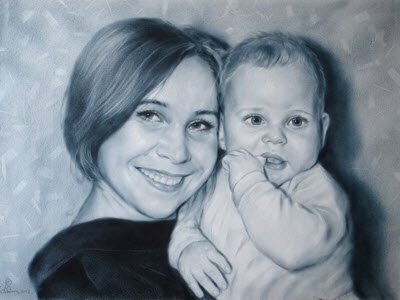 Use a mixed technique of painting and drawing, where oil paint too. 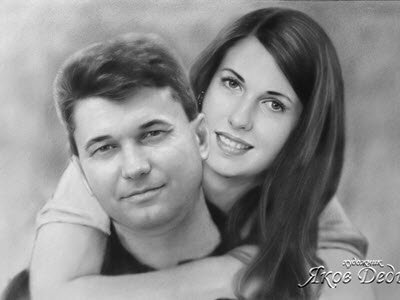 directly from the artist's portrait, in modern times, it became a lot easier. 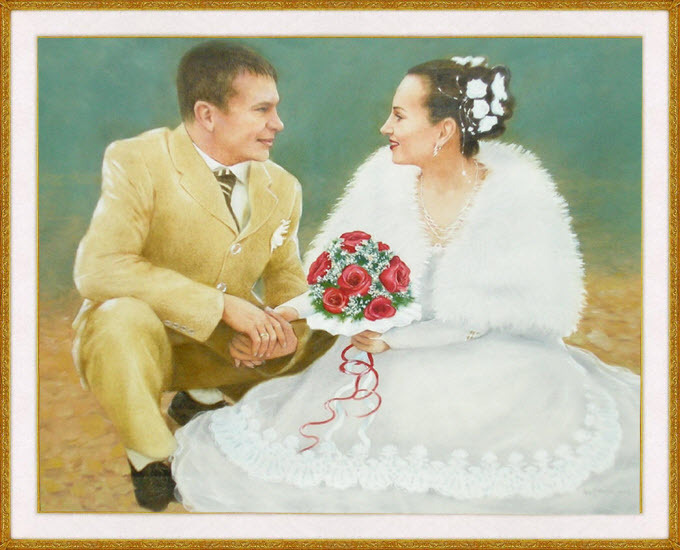 modern communications will contact the artist and order painting without intermediaries. 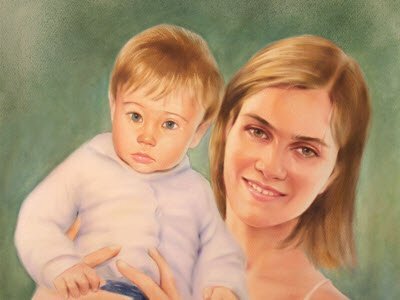 using the pictures and text on other websites or sources of information is possible only with the direct link to this website. 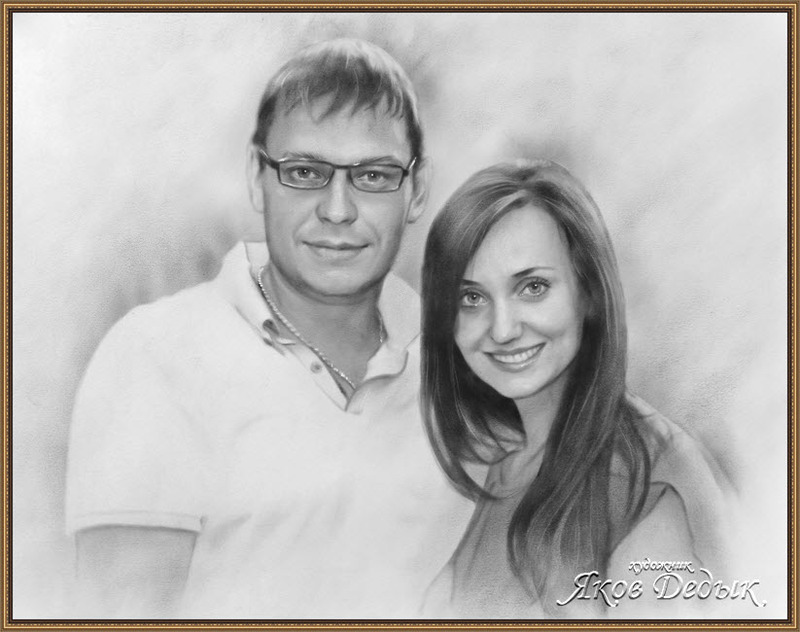 adhere to please my copyright.